Kathleen Byron, who died on January 18 2009 aged 88, was an English actress. In the British cinema of the Forties, her beauty was faintly disquieting. When Margaret Lockwood played “wicked ladies”, audiences knew where they were. She was a bad lot, and that was it. With Kathleen Byron they never quite knew what to expect. There were hints of schizophrenia in her on-screen personality that left people deeply uneasy. The film that best reflected this was Black Narcissus (1947), adapted by Michael Powell and Emeric Pressburger from a novel by Rumer Godden which was set in a convent high in the Himalayas. Kathleen Byron played Sister Ruth. This was a terrific role for her. When she was told she had got the part Michael Powell said ‘make the best of it Kathleen because you will never get a part as good again. She later said that she agreed with him and she didn’t think she had ever had a part anywhere as good again. Above: Avery interesting Cinema Newpaper Advertisement – Surprising to see what choices are made of which films to feature on a Double Bill. 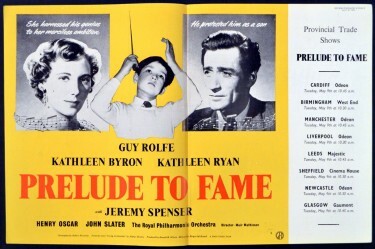 We see Kathleen Byron in ‘Prelude to Fame’ with Guy Rolfe and Jeremy Spenser – who seemed to have a successful career in films and on Television – as a child star – in the early to mid 50s but the sort of fell off the radar. He continued in films up to being nearly 30 years old though – and indeed he made quite a lot of films. Now back to Kathleen Byron – Michael Powell was the director who best understood her talents, and he offered her roles that would tap them. The first was a small part in the whimsical A Matter of Life and Death (1946) as an angel whose job is to take down the particulars of recently dead airmen prior to sending them before the heavenly tribunal. Her third film with Michael Powell was The Small Back Room. The story of a troubled scientist (David Farrar) who hits the bottle under the pressure of wartime research. Far from being the traditional, subservient “love interest”, her role became the stronger of the two, capable of galvanising Farrar out of his self-absorption. It was not how audiences expected their heroines to behave in 1949. The daughter of a railway clerk who became a Labour mayor of East Ham, Kathleen Elizabeth Byron was born on January 11 1923 and educated at East Ham grammar school. She said she spent her schoolyears “daydreaming of becoming an actress” and obtained a scholarship to the Old Vic. After war service in censorship, she spent some time with the theatre’s company, obtaining her first speaking part in the film The Young Mr Pitt (1942). In 1943 she married Lieutenant John Bowen, a USAAF pilot, joining him in the States; but her career did not prosper there, and Michael Powell persuaded her to return home. The late Forties, in which she made the three films with Powell, were the most productive of her career. Afterwards it languished. A second trip to Hollywood in 1953 to play in Young Bess led nowhere. Her part was overshadowed by Jean Simmons as the young Queen Elizabeth I and by Deborah Kerr as Catherine Parr. Increasingly, she drifted into second features and supporting parts in bigger pictures. Few were memorable. They ranged from stolid literary adaptations such as Tom Brown’s Schooldays (1951) to such horror pictures as Night of the Eagle (1962) and Craze (1973). When she landed more prestigious roles, they failed to register with audiences. 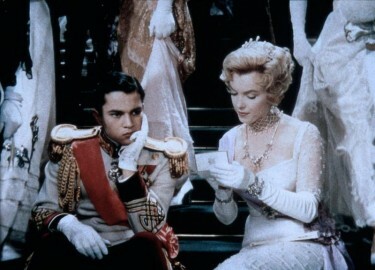 Her Desdemona, for example, was heard rather than seen – on the soundtrack of the dubbed version of a Russian film of 1957. For a time in the mid-Sixties a car accident, in which she broke her pelvis and some ribs, kept her out of British films. After recovering she was frequently cast in matriarchal roles. She was Robin Hood’s mother in Wolfhead (1969) and the mother of a Polish patriot in From a Far City: Pope John Paul II (1981), both made for television. There was a cameo role as Lady Waddington in The Elephant Man (1980), the part of Mrs Goddard alongside Gwyneth Paltrow in Emma (1995) and old Mrs Ryan in the Oscar-winning Saving Private Ryan (1998). She found more rewarding work in television, appearing in literary adaptations (Portrait of a Lady and The Golden Bowl) and in long-running soaps such as Emmerdale Farm. In a series based on the life of King Edward VII, she played Queen Louise of Denmark, mother of Alexandra, the future Queen of England. Her first marriage was dissolved in 1950. She married, secondly, the radio journalist Alaric Jacob, who predeceased her. A son, a daughter, and a stepdaughter survive her. 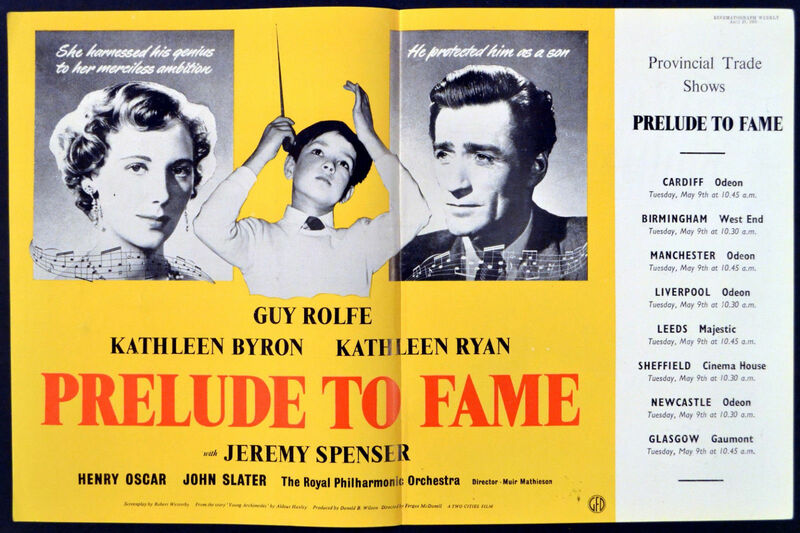 In 1949, J. Arthur Rank wanted Bobby Henrey to star in “Prelude to Fame”, but Sir Alexander Korda, to whom Bobby was under contract at London Films, wouldn’t loan him out to Rank. So Jeremy Spenser got the part of the child musical genius. Later that year, Korda had Bobby starring as a child musical genius in a very similar film, “The Wonder Kid”. 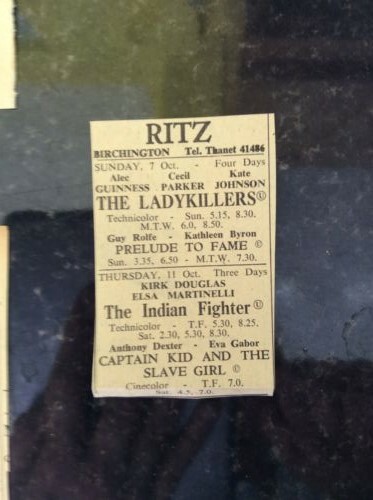 The Wonder Kid is available quite cheaply on a Network DVD available from amazon uk and all the usual suspects. After Bobby Henrey’s huge success in The Fallen Idol, Korda signed him to a £30,000 contract (an absolute fortune at the time) to make four more films for him between 1948 and 1952, only one of which, The Wonder Kid, was ever made. I find I have to post the same comment here twice before it can be seen at your end.